Is it strange that Americans keep up a tradition of letting a rodent decide when we’re calling it on winter? Yes. 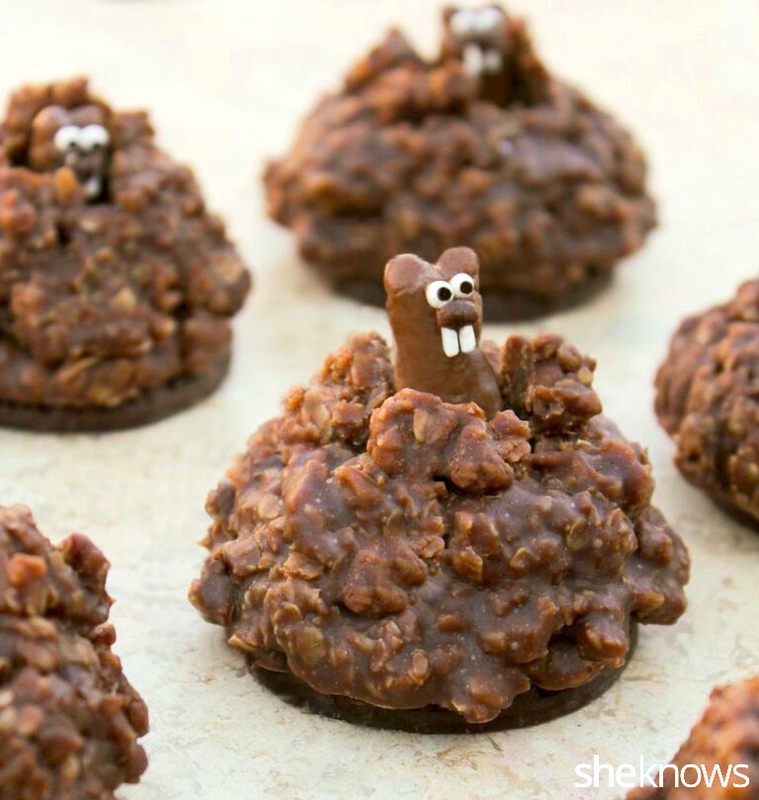 And while Groundhog Day isn’t exactly the most exciting holiday on the calendar, you can make it a heck of a lot more festive with some easy, adorable Groundhog Day cookies. 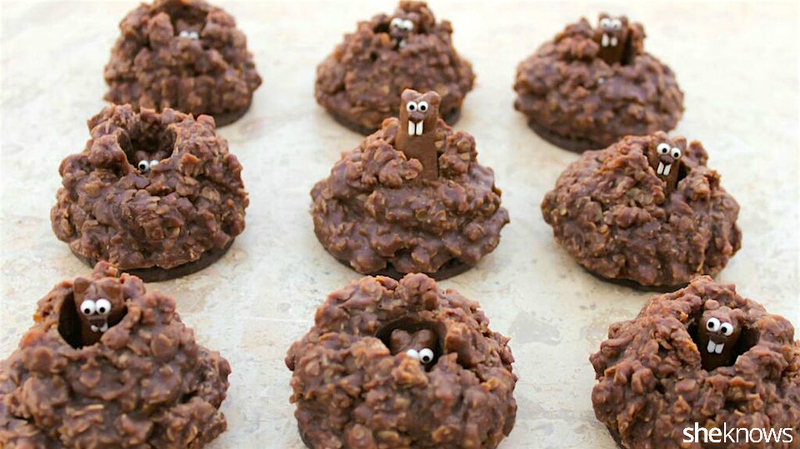 Cross your fingers good ol’ Punxsutawney Phil calls an end to this winter, but if not, at least you’ll have these edible little guys to console you. 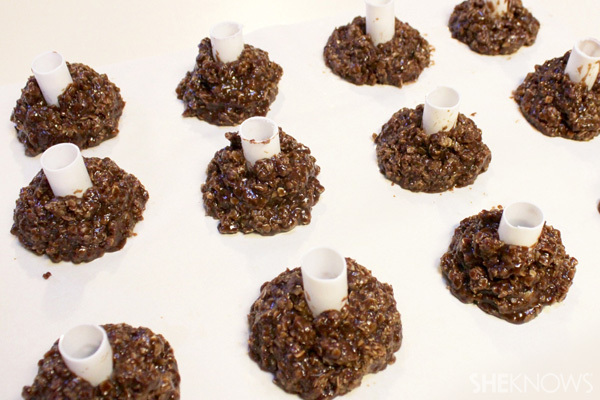 Before mixing the cookies, arrange your plastic cake dowels on a sheet of parchment paper or waxed paper. In a large pan on the stove, mix and melt the sugar, cocoa powder, butter and milk over high heat. Boil for 1 minute. Remove from the heat. 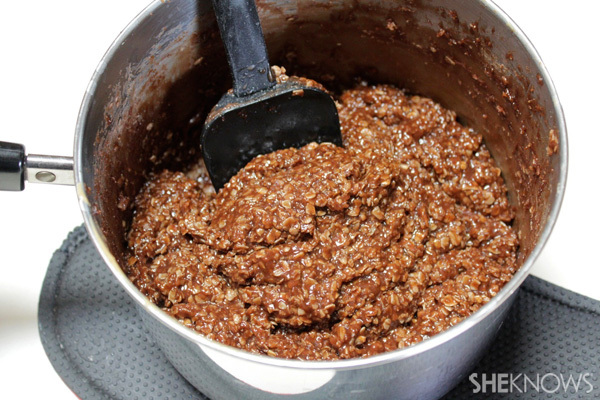 Add the peanut butter, vanilla and oatmeal. Mix well. 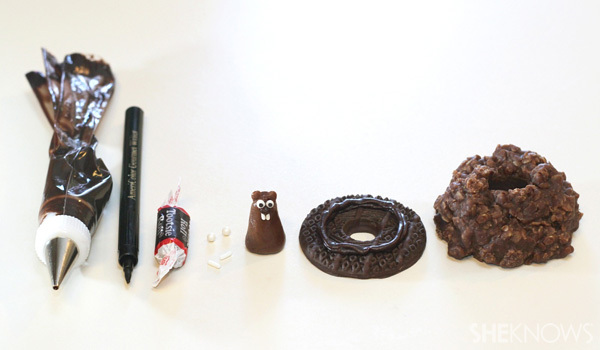 Soften a Tootsie Roll with your hands or in a microwave for a few seconds. Mold the ears and head, and widen the body so that it has a base slightly larger than the hole of your Fudge Stripe cookies but will fit through the hole in the cookie mound. 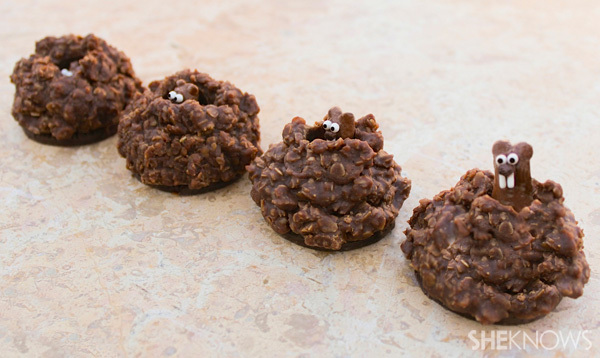 Secure the eyes and teeth with a tiny dab of chocolate frosting or chocolate candy melts. Make a nose with another dab of chocolate. Draw 2 black dots on the eyes with an edible food color marker. Pipe a circle of chocolate frosting or chocolate candy melts onto the Fudge Stripe cookie. 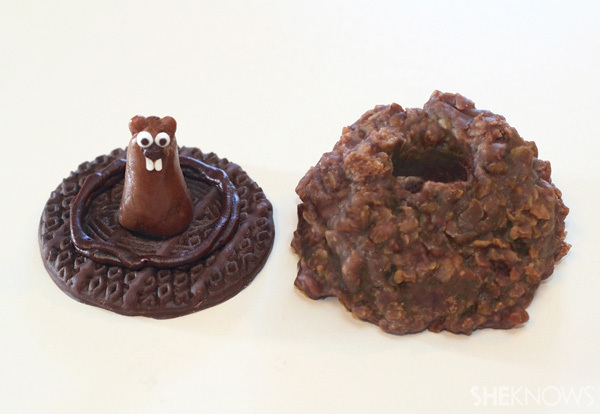 Place 1 Tootsie Roll groundhog over the center hole. Place a cookie mound over both, securing it to the frosted bottom cookie. Allow the chocolate to harden. Insert your pinkie or index finger into the hole to make your groundhog move up and down. 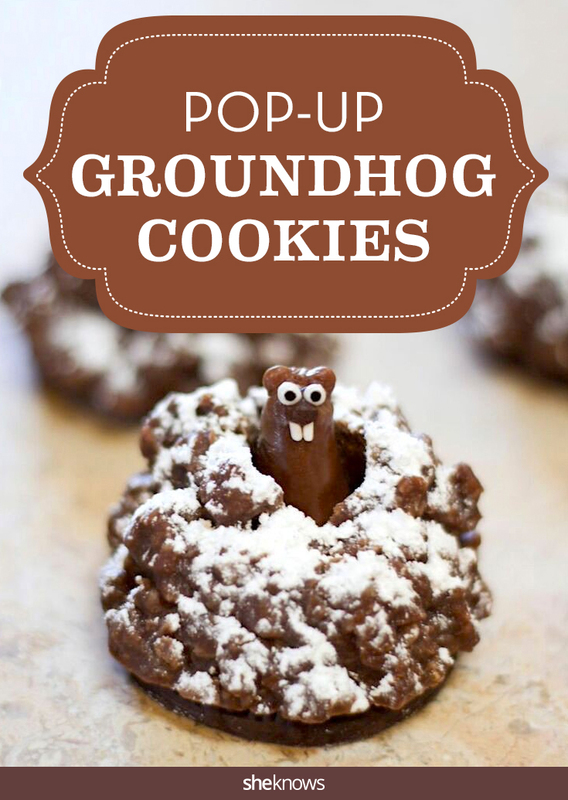 Optional: If you want to make it look like your groundhogs are coming out of a snow-covered mound, just sprinkle a little powdered sugar on top. You can also make a savory Groundhog Day dinner with these adorable groundhog hot dogs.